My Dad always liked to celebrate Bastille Day, so this is published in his honor. Anyhow, Vichyssoise originated in France, n’est-ce pas? We enjoy leek and potato soup and it is the recipe I make over and over during cool weather. Now that it is July, I have turned to chilled soups and decided to revisit this classic French soup. My recipe has evolved over the years and I have no idea of its origins, but suspect it came from Fanny Farmer. Using homemade or reduced sodium chicken stock limits the salt without cutting back on flavor. This soup tastes better as it sits, so try to make it a day ahead of serving. It is hearty enough for lunch or a casual supper, unlike many cold soups. I like to garnish it with chives from the garden. TIP: Slice the trimmed leeks lengthwise before washing to insure removing the grit. TIP: Invest in an immersion blender to simplify your prep. Mine cost about $25. 1. Heat the olive in a soup pot. Add chopped leeks and onions and cook over medium heat until limp, about five minutes.Do not brown the leeks and onions. 2. Add the diced potatoes and chicken stock. Reduce heat to medium-low, cover the pot and cook until potatoes are easily pierced with a fork, about 20 minutes. 3. Add the flour and milk or cream. Using a whisk, stir to break up the flour and cook for 3 minutes. 4. Using either an immersion or standing blender, puree the soup until smooth. Add salt and/or pepper to taste. 5. Chill a minimum of 8 hours, preferably overnight. 6. Stir and serve cold with a garnish of chopped chives. My Dad always made a big deal about Bastille Day – and he was 100% Hungarian! I haven’t had vichyssoise in ages, and now I wonder why! Thanks for the recipe. Sure – it was so chilly here that we had 2 bowls cold, then heated up the rest. I picked up a couple of leeks from the market just this afternoon because they had really long white parts.” (More bang for my buck, right?) 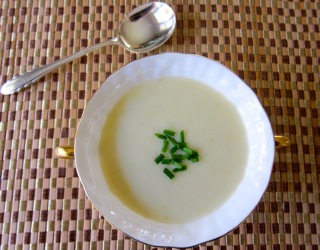 It was my intention to make a potato and leek soup… might as well go fancy and make it a vichyssoise!!! It’s nice in hot weather – thanks!